Loggerhead sea turtle. Photo by Cumberland Island National Seashore, used under Creative Commons licensing. Post by Jessica Norris, reposted from Biohabitats' Leaf Litter with permission The United States alone has over 12,000 miles of seashore, and sea level rise will affect all of it. Many coastal communities are hardening their shorelines by enhancing bulkheads and other protective engineered structures, but such preparations will not help the non-human inhabitants of our shores find a place to live in the face of rising sea levels. Other approaches will be necessary if we are to allow coastal species to move in response to climate change. A Red knot. Photo by Jason Crotty, used under Creative Commons licensing. Our efforts to prepare our coasts for climate change will affect coastal species that depend on specific coastal habitat (such as Seaside sparrows in the salt marsh) and a suite of species that reaches beyond the list of local inhabitants. 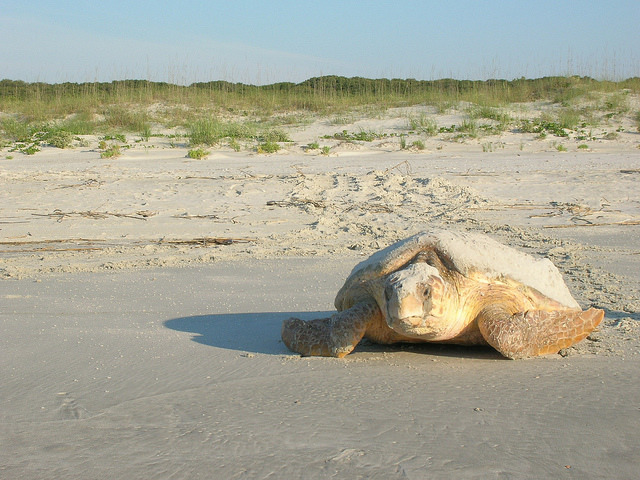 Many animals rely on the coasts for parts of their life cycle: think of the single but critical night a Loggerhead turtle might come to shore to create a nest. Along the Atlantic flyway, migratory birds use seasonally available coastal resources. 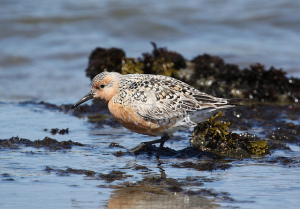 The migration of the Red knot, for example, is carefully timed to coincide with the availability of the eggs of horseshoe crabs. Coastlines are inherently dynamic systems, and sea level has changed throughout geological time. During the most recent ice age, about 20,000 years ago, the sea level was about 130 meters below where it is today. Coastal plant and animal communities adjusted to the change, but two factors make adjusting to modern climate change different. First is the rate of change, which is estimated to be higher today than any time in the last 5000 years. Second, coastal systems are now so heavily built, there is often no room for migration. What climate change will do to coastal ecology and how we can mitigate it depends heavily on local hydrology and the type of shoreline that we are talking about. 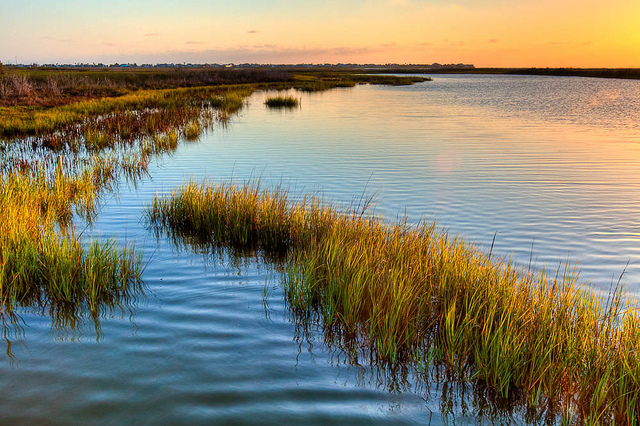 A thumbnail classification of coastal ecosystems, used by NOAA, includes rocky shores, mud or sand flats, sand or gravel beaches (including those of barrier islands, which pose a special problem), and vegetated shores. Vegetated shores, which are often salt marshes in temperate zones and mangroves in tropical ones, are usually found on semi-protected stretches, where the wave action is not direct or intense. Armored shores, which have been reinforced by engineers, are yet another category, though they typically do not provide habitat for species, and therefore fall outside the focus of this article. No matter the system under consideration, there are two overarching considerations. The first is the geologic context of a site and its history of formation. For instance, the location of headlands and offshore bathymetry may constrain the way a shoreline will be affected by storms or sea level fluctuations. Sediment transport is the second factor that will affect every site, and this dynamic brings in some upland factors, such as the sediment load of rivers, upstream dams, etc. Even under the stable sea levels of the last millennia, coastal habitats represent a balance between accretion that deposits material onto the coast and the erosive force of the ocean. There are plenty of examples of coastlines where this balance tipped, such as that of Edingsville Beach, South Carolina, a pre-civil war resort town with over 60 buildings that was washed away by storm events over a hundred years ago. As we move into a future of sea level rise projected to reach a meter by 2100, we face the question of whether and where we can affect that balance of sedimentation and erosion so that coastal plants and animals will have a chance to move with our shoreline. Examples of such solutions can be found for every type of shoreline. Losing beaches to erosion is enormously costly to local economies because of lost visitors and lost protection of infrastructure, so beach renourishment is the most significant large-scale management technique currently in use to prevent erosion. Beach renourishment means adding sand to a beach, often from coastal areas just beyond the shore. We do not understand the effect on local hydrology, especially when the source of the sand is close to where it is ultimately placed, for example if it comes from just offshore. Deepening the seafloor undoubtedly affects wave formation and the forces at work on the beach, but we don’t have a definitive explanation of the mechanisms, which, in any case, vary by site. The design of the beach is a little better understood. Beaches that are built or preserved with dune systems tend to be more resilient than those without, and they are better able to withstand storm events. Barrier islands present unique opportunities for and challenges to beach restoration and conservation. Barrier islands, which make up about 12% of the world’s coasts, are extremely dynamic systems, in which the beach is typically eroded from the seaward side and sand is accreted on the inland side, usually during storm events that overwash the entire barrier. However, since barrier islands are also popular for tourist development or even the construction of cities, such as Abu Dhabi, this natural balance is usually impeded, and developed barrier islands tend to erode from both sides. Galveston Island State Park. Photo by Dan Thibodeaux, used under Creative Commons licensing. Galveston Island State Park in Texas is an interesting example because it actually spans the entire width of its barrier island. Biohabitats was contracted to work on its master plan after Hurricane Ike caused serious damage to park amenities—and we had the opportunity to explicitly consider the existing habitat types and how each might respond to sea level rise and future intense storms. Nevertheless, without galvanizing events such as these severe storms, climate change scenarios are too often neglected in coastal planning. A clapper rail in Delaware. Photo by U.S. Fish and Wildlife Service Northeast Region, used under Creative Commons licensing. Vegetated shorelines such as salt marshes are systems that host a unique set of species and are unlikely to be able to move fast enough to remain intact in the face of sea level rise, especially where development and changes in hydrology have altered habitat immediately inland. 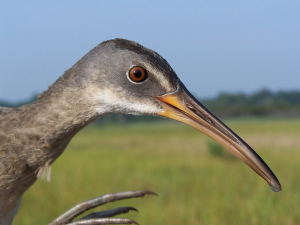 The DC-Maryland Audubon is thinking specifically about preserving salt marsh habitat for species such as the seaside sparrow, black rail and clapper rail, all of which rely on Atlantic coast salt marshes. They are working in a site in southern Dorchester County, MD, to ameliorate the threat posed to them by sea-level rise. In order to help ensure that this bird habitat can survive sea level rise, they employ a dual approach. “We need to make sure there are places to move upslope,” said David Curson, the Audubon chapter’s director of bird conservation, “and we need to increase the resilience of today’s marshes in order to slow the rates of loss.” The results of their strategic assessment of ecological conditions revealed that the highest priority marshes were large open marshes, saltier marshes and intact marshes. They then modelled 25 year increments of marsh loss to pinpoint the best opportunities for marsh migration corridors, prioritized by whether they would be good investments, i.e. the likelihood of success. The first stages of implementing the plan were removing 10 acres of salt-stressed pines to accelerate the transition to open tidal marsh and a Phragmites control campaign. In the next steps, they will be attempting to raise the level of some of the priority marsh areas by blowing quantities of sediment over the open marsh, in effect mimicking the natural deposition process on an accelerated time scale. This technique is commonly used to bolster coastal protections in the Mississippi corridor and elsewhere. Projects such as Audubon’s, which explicitly address adapting to sea level rise as a conservation goal, are few and far between. Even in the wake of events such as Superstorm Sandy, restoration projects too often neglect the real future of sea level rise, and perhaps the reasons are understandable. After all, the science of coastal restoration originated in the 1960s, and few restorations have endured anything like the scale of change we expect over the next 100 years. Even the life expectancy of most engineered bulkheads is only about half that. Significant variations in local conditions and dynamics also make generalizations difficult, but we can at least assert two things. The Sand Motor in the Netherlands. Photo by Silvain de Munck, used under Creative Commons licensing. First, restoration practitioners are the repository of most of the accumulated knowledge and expertise in the techniques that would help, and second, innovation must be unceasing. There are fascinating experiments already underway. For example, the Dutch have created the Sand Motor, an artificial peninsula of 21,500,000 m3 of sand created in 2011 as an alternative to their previous five-year cycle of regular beach renourishment. The 315-acre sand deposition experiment defies conventional beach renourishment, letting nature do the work to deposit sand along a stretch of coast that protects dense human settlements, the buffer wetlands, and the beach habitat. The first major push for evaluating its progress and determining whether it is functioning as it was designed to is now underway, so the jury is still out on whether this experiment will be deemed a success for infrastructure protection, much less for facilitating species movement. Nevertheless, it embodies the sort of innovation that will be needed in order to help our coasts and their inhabitants accommodate climate change.